Recipes, Tips, & Reviews from home cooks better than I am. How do you like your Thanksgiving dinner? Do you go with the traditional roast turkey and all the fixings, do you buck tradition in little ways like deep frying your bird, or do ignore tradition entirely and head out for exotic cuisines from far off lands? While Thanksgiving is mostly about family and food, there are other traditions. Football, Macy’s Thanksgiving Day Parade, and many other events vie for our attention on that fourth Thursday of November. This November, BigOven is starting a #FoodFight, asking cooks to sound off on the big Thanksgiving questions on our blog, Facebook and Twitter. BigOven will propose a Thanksgiving-oriented debate each day, and America’s cooks will weigh in. Results will be posted with related recipes, menus and tips from BigOven, a top-rated recipe and organization website and app with a database of 350,000+ recipes. TV allowed or no TV allowed? Do you like to host or visit others? Are sweet potatoes better with marshmallows, or does this classic belong locked in the 1950’s? 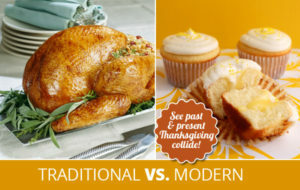 Various other food-related debates that rage on during Thanksgiving planning. Go on over & join the conversations! Prepare the oysters. Combine the flour & cracker meal & dredge the oysters in the mixture. Let the oysters sit, refrigerated, for 20 minutes. Heat the oil to about 350°F on medium heat. Add in the butter (optional for flavor). Fry the oysters until crispy, about 1-2 minutes per side. The oysters are done when they are golden brown & crispy. Transfer the fried oysters to a paper towel lined plate. Sprinkle with sea salt & serve hot with spicy cocktail sauce and lemon wedges. Chef’s Note:This is a great recipe for the holidays and goes well as croutons on a salad or as part of the dressing in a Thanksgiving turkey!